Thanks for your support for SiteTag. We increased several tracking project in 2013/03/05 - realtime article lists. The from source and page number. Let Webmaster know the most realtime visits info and know page number from search engine. The most realtime searched artilce lists in your site. collect the keywords that visits really interested. The time that the article be searched. Refresh button. You can get the most realtime info without reload whole page. Let Webmaster know the most realtime visits info and user can understand the content of this website. Whole new design：Whole new logo, interface and working flow give you whole new experience. One account with many websites：Do you have multiple websites? No longer need to register more accounts. One account can manage many websites now! The way to active tracking code：After embed tracking code, it will be activated normally and start to tracking records until you pass system check. Top 100 Tags：Provide percentage report. The way of calculation can switch by total, last week, this week. Blacklist：You can hide the tags that you don't like. And it will stop recording the search keywords in the blacklist. Thanks for supporting SiteTag again. If you have any feedback, please feel free contact us! website will keep working as usual. After upgrading, SiteTag will show you whole new experience. Thanks for supporting SiteTag again. 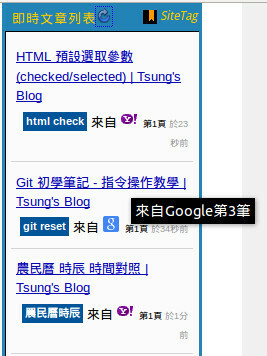 SiteTag used to have some problems about system performance, and the thumbnails of some websites can not be displayed correctly during the heavy hours. We apologize for the inconvenience. SiteTag switched to the thumbnail service provided by Thumbalizr, and all the thumbnails can be displayed correctly. However, since we use the service provided by Thumbalizr, we can no longer update the thumbnails by ourselves but rely on Thumbalizr periodically updates. As more and more web sites use our service, SiteTag recently system overload several times, Sorry! Though most search engines use UTF-8 encoding, some of them still use local encoding, (for example Baidu uses GB2312), and this will turn tags into confusing codes. To solve this problem, we did double character conversion for "Simplified Chinese" web site, and convert GB2312 into UTF-8, so we can display the tags correctly now. We currently support more than one hundred search engines. Since there's no standard character encoding among the search engines, the confusing codes may still exist. Please be patient and we will fix it ASAP. Thanks!